Not to be confused with Remembrance Sunday or Armistice Day. This article is about the military memorial day on 11 November. For other uses, see Day of Remembrance. Remembrance Day (sometimes known informally as Poppy Day owing to the tradition of the remembrance poppy) is a memorial day observed in Commonwealth member states since the end of the First World War to remember the members of their armed forces who have died in the line of duty. Following a tradition inaugurated by King George V in 1919, the day is also marked by war remembrances in many non-Commonwealth countries. 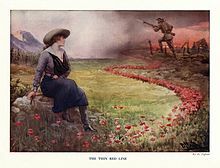 Remembrance Day is observed on 11 November in most countries to recall the end of hostilities of First World War on that date in 1918. Hostilities formally ended "at the 11th hour of the 11th day of the 11th month", in accordance with the armistice signed by representatives of Germany and the Entente between 5:12 and 5:20 that morning. ("At the 11th hour" refers to the passing of the 11th hour, or 11:00 am.) The First World War officially ended with the signing of the Treaty of Versailles on 28 June 1919. The tradition of Remembrance Day evolved out of Armistice Day. The initial Armistice Day was observed at Buckingham Palace, commencing with King George V hosting a "Banquet in Honour of the President of the French Republic" during the evening hours of 10 November 1919. The first official Armistice Day was subsequently held on the grounds of Buckingham Palace the following morning. During the Second World War, many countries changed the name of the holiday. Member states of the Commonwealth of Nations adopted Remembrance Day, while the US chose Veterans Day. The common British, Canadian, South African, and ANZAC tradition includes a one- or two-minute silence at the eleventh hour of the eleventh day of the eleventh month (11:00 am, 11 November), as that marks the time (in the United Kingdom) when the armistice became effective. 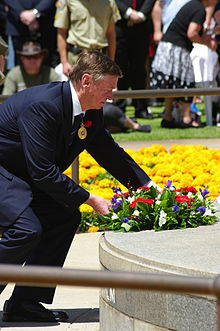 The Service of Remembrance in many Commonwealth countries generally includes the sounding of the "Last Post", followed by the period of silence, followed by the sounding of "Reveille" or sometimes just "The Rouse" (often confused for each other), and finished by a recitation of the "Ode of Remembrance". The "Flowers of the Forest", "O Valiant Hearts", "I Vow to Thee, My Country" and "Jerusalem" are often played during the service. Services also include wreaths laid to honour the fallen, a blessing, and national anthems. The central ritual at cenotaphs throughout the Commonwealth is a stylised night vigil. The Last Post was the common bugle call at the close of the military day, and The Rouse was the first call of the morning. For military purposes, the traditional night vigil over the slain was not just to ensure they were indeed dead and not unconscious or in a coma, but also to guard them from being mutilated or despoiled by the enemy, or dragged off by scavengers. This makes the ritual more than just an act of remembrance but also a pledge to guard the honour of war dead. The act is enhanced by the use of dedicated cenotaphs (literally Greek for "empty tomb") and the laying of wreaths—the traditional means of signalling high honours in ancient Greece and Rome. In Australia, Remembrance Day is always observed on 11 November, regardless of the day of the week, and is not a public holiday; it is a time when people can pay their respects to the substantial number of soldiers who died in battle. Some institutions observe two-minutes' silence at 11 am through a programme named Read 2 Remember, children read the Pledge of Remembrance by Rupert McCall and teachers deliver specially developed resources to help children understand the significance of the day and the resilience of those who have fought for their country and call on children to also be resilient when facing difficult times. Services are held at 11 am at war memorials and schools in suburbs and cities across the country, at which the "Last Post" is sounded by a bugler and a one-minute silence is observed. In recent decades, Remembrance Day has been largely eclipsed as the national day of war commemoration by ANZAC Day (25 April), which is a public holiday in all states. When Remembrance Day falls on a normal working day in Melbourne and other major cities, buglers from the Australian Defence Force often play the "Last Post" at major street corners in the CBD. While this occurs, the majority of passers-by stop and observe a moment of silence while waiting for the bugler to finish the recital. In Barbados, Remembrance Day is not a public holiday. It is recognised as 11 November, but the parade and ceremonial events are carried out on Remembrance Sunday. The day is celebrated to recognise the Barbadian soldiers who died fighting in the First and Second World Wars. The parade is held at National Heroes' Square, where an interdenominational service is held. The Governor-General and Barbadian Prime Minister are among those who attend, along with other government dignitaries and the heads of the police and military forces. During the main ceremony a gun salute, wreaths, and prayers are also performed at the war memorial Cenotaph at the heart of Heroes' Square in Bridgetown. In Belize, Remembrance Day is observed on 11 November. It is not a public holiday. 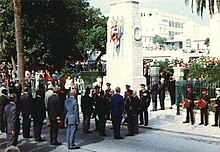 In Bermuda, which sent the first colonial volunteer unit to the Western Front in 1915, and which had more people per capita in uniform during the Second World War than any other part of the Empire, Remembrance Day is still an important holiday. The parade in Hamilton had historically been a large and colourful one, as contingents from the Royal Navy, British Regular Army and Territorial Army units of the Bermuda Garrison, the Canadian Forces, the US Army, Air Force, and Navy, and various cadet corps and other services all at one time or another marched with the veterans. Since the closing of British, Canadian, and American bases in 1995, the parade has barely grown smaller. In addition to the ceremony held in the City of Hamilton on Remembrance Day itself, marching to the Cenotaph (a smaller replica of the one in London), where wreaths are laid and orations made, the Royal Navy and the Bermuda Sea Cadet Corps held a parade the same day at the HMS Jervis Bay memorial in Hamilton, and a smaller military parade is also held in St. George's on the nearest Sunday to Remembrance Day. In Canada, Remembrance Day (Jour du Souvenir) is a statutory holiday in all three territories and in six of the ten provinces (Nova Scotia, Manitoba, Ontario, and Quebec being the exceptions). From 1921 to 1930, the Armistice Day Act provided that Thanksgiving would be observed on Armistice Day, which was fixed by statute on the Monday of the week in which 11 November fell. In 1931, the federal parliament adopted an act to amend the Armistice Day Act, providing that the day should be observed on 11 November and that the day should be known as Remembrance Day. A bill (C-597) intended to make Remembrance Day a federal statutory holiday was tabled in the House of Commons during the 41st parliament, but died on the order paper when parliament was dissolved for a federal election. The federal department of Veterans Affairs Canada states that the date is of "remembrance for the men and women who have served, and continue to serve our country during times of war, conflict and peace"; particularly the First and Second World Wars, the Korean War, and all conflicts since then in which members of the Canadian Armed Forces have participated. The department runs a program called Canada Remembers with the mission of helping young and new Canadians, most of whom have never known war, "come to understand and appreciate what those who have served Canada in times of war, armed conflict and peace stand for and what they have sacrificed for their country." The official national ceremonies are held at the National War Memorial in Ottawa. These are presided over by the Governor General of Canada and attended by the prime minister, other dignitaries, the Silver Cross Mother, and public observers. Occasionally, a member of the Canadian Royal Family may also be present (such as Prince Charles in 2009 and Princess Anne in 2014). Before the start of the event, four sentries and three sentinels (two flag sentinels and one nursing sister) are posted at the foot of the cenotaph. The commemoration then typically begin with the tolling of the carillon in the Peace Tower, during which current members of the armed forces arrive at Confederation Square, followed by the Ottawa diplomatic corps, ministers of the Crown, special guests, the Royal Canadian Legion (RCL), the royal party (if present), and the viceregal party. The arrival of the governor general is announced by a trumpeter sounding the "Alert", whereupon the viceroy is met by the Dominion President of the RCL and escorted to a dais to receive the Viceregal Salute, after which the national anthem, "O Canada", is played. The moment of remembrance begins with the bugling of "Last Post" immediately before 11:00 am, at which time the gun salute fires and the bells of the Peace Tower toll the hour. Another gun salute signals the end of the two minutes of silence, and cues the playing of a lament, the bugling of "The Rouse", and the reading of the Act of Remembrance. A flypast of Royal Canadian Air Force craft then occurs at the start of a 21-gun salute, upon the completion of which a choir sings "In Flanders Fields". The various parties then lay their wreaths at the base of the memorial; one wreath is set by the Silver Cross Mother (a recent recipient of the Memorial Cross) on behalf of all mothers whose children died in conflicts in which Canada participated. The viceregal and/or royal group return to the dais to receive the playing of the Canadian Royal Anthem, "God Save the Queen", prior to the assembled armed forces personnel and veterans performing a march past in front of the viceroy and any royal guest, bringing about the end of the official ceremonies. A tradition of paying more personal tribute has emerged since erection of the Tomb of the Unknown Soldier at the War Memorial in 2000: after the official ceremony the general public place their poppies atop the tomb. Similar ceremonies take place in provincial capitals across the country, officiated by the relevant lieutenant governor, as well as in other cities, towns, and even hotels or corporate headquarters. Schools will usually hold special assemblies for the first half of the day, or on the school day prior, with various presentations concerning the remembrance of the war dead. The largest indoor ceremony in Canada is usually held in Saskatoon, Saskatchewan, with over 9,000 gathering in Credit Union Centre in 2010; the ceremony participants include veterans, current members of the Canadian forces, and sea, army, and air cadet units. In 1994, National Aboriginal Veterans Day was inaugurated to recognise the contribution of Aboriginal soldiers. In 2001, Merchant Navy Remembrance Day was created by the Canadian parliament, designating 3 September as a day to recognise the contributions and sacrifice of Canadian merchant mariners. In India, the day is usually marked by tributes and ceremonies in army cantonments. There are memorial services in some churches such as St. Mark's Cathedral and St. John's Church in Bangalore. At Kohima and Imphal in the remote hillsides of North East India, services of remembrance supported by the Indian Army are observed at Kohima and Imphal War Cemeteries (maintained by the Commonwealth War Graves Commission). The day is also marked at the Delhi War Cemetery. In other places in India this event is not observed. In 2013, Prince Charles and Camilla, Duchess of Cornwall, marked the day in Mumbai's St. John the Evangelist Church. In Kenya, the Kenya Armed Forces Old Comrades Association (KAFOCA) was established in Kenya immediately in 1945 to cater for the welfare of the Ex-servicemen of the First and the Second World Wars. The KAFOCA and Kenyan government recognise Remembrance Day. New Zealand's national day of remembrance is Anzac Day, 25 April. "Poppy Day" usually occurs on the Friday before Anzac Day. The reason for New Zealand having their remembrance on Anzac Day happened in 1921. The paper Poppies for Armistice that year arrived by ship too late for 11 November 1921, so an RSA branch distributed them at the next commemoration date (25 April 1922, which happened to be Anzac Day) and that date stuck as the new Poppy Day in New Zealand. Armistice Day was observed in New Zealand between the World Wars, although it was always secondary to Anzac Day. As in other countries, New Zealand's Armistice Day was converted to Remembrance Day after World War II, but this was not a success. By the mid-1950s the day was virtually ignored, even by churches and veterans' organisations. Since the Unknown Warrior being returned to New Zealand for Armistice Day 2004, more ceremonies are now being held in New Zealand on Armistice Day and more churches are now observing Remembrance Sunday. Like Barbados, St. Lucia does not recognise Remembrance day as a public holiday. Instead, ceremonial events such as parades and other activities are held on Remembrance Sunday. The parade is held at the central square, namely the Derek Walcott Square, where the Cenotaph is located. There, members of the Royal St Lucia Police Force and other uniformed groups such as the St Lucia Cadet Corps pay tribute through commemoration of St. Lucian men and women who fought in the war. In South Africa, Remembrance Day is not a public holiday. Commemoration ceremonies are usually held on the nearest Sunday, at which the "Last Post" is played by a bugler followed by the observation of a two-minute silence. Ceremonies to mark the event in South Africa are held at the Cenotaph in Cape Town, and in Pretoria at the Voortrekker Monument cenotaph and the War Memorial at the Union Buildings. Many high schools hold Remembrance Day services to honour the past pupils who died in the two World Wars and the Border war. In addition, the South African Legion of Military Veterans holds a street collection on the nearest Saturday to gather funds to assist in welfare work among military veterans. 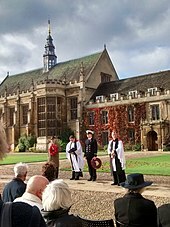 Wreath-laying ceremonies, usually organised by local branches of the Royal British Legion, are observed on Remembrance Day at most war memorials across the UK at 11 am on 11 November, with two minutes of silence observed; a custom which had lapsed before a campaign for its revival began in the early 1990s. Many employers and businesses invite their staff and customers to observe the two minutes' silence at 11:00 am. The beginning and end of the two minutes' silence is often marked in large towns and cities by the firing of ceremonial cannon. 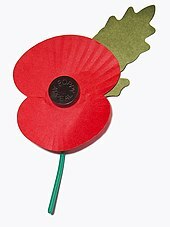 In the United Kingdom, the main observance is Remembrance Sunday, held on the Sunday nearest to 11 November. There is a National Service of Remembrance in London, as well as other services and ceremonies in the regions. Typically, poppy wreaths are laid by representatives of the Crown, the armed forces, and local civic leaders, as well as by local organisations including ex-servicemen organisations, cadet forces, the Scouts, Guides, Boys' Brigade, St John Ambulance and the Salvation Army. A minute's or two minutes' silence is also frequently incorporated into church services. In 2014 the Royal Mint issued a colour-printed Alderney £5 coin, designed by engraver Laura Clancy, to commemorate Remembrance Day. Also in 2014, to commemorate the outbreak of World War I a huge display called Blood Swept Lands and Seas of Red, consisting of 888,246 ceramic poppies was installed in the moat of the Tower of London, each poppy representing a British Empire fatality. On 5 November 2018 and set to continue for 4 months, about 10,000 torches were lit at the foot of the Tower’s walls, in its dry moat to mark the centenary of the end of the World War I.
Remembrance Day is officially observed in Northern Ireland in the same way as in the rest of United Kingdom, although it tends to be associated more with the unionist community. Most Irish nationalists and republicans do not take part in the public commemoration of British soldiers organized by the Royal British Legion. This is mainly due to the actions of the British Army during The Troubles. However, some moderate nationalists began to attend Remembrance Day events as a way to connect with the unionist community. In 1987 a bomb was detonated by the Provisional Irish Republican Army (IRA) just before a Remembrance Sunday ceremony in Enniskillen, killing eleven people. The IRA said it had made a mistake and had been targeting soldiers parading to the war memorial. The bombing was widely condemned and attendance at Remembrance events, by both nationalists and unionists, rose in the following years. The Republic of Ireland has a National Day of Commemoration in July for all Irish people who have died in war. Remembrance Day (11 November) is a national holiday in France and Belgium. It commemorates the armistice signed between the Allies and Germany at Compiègne, France, for the cessation of hostilities on the Western Front, which took effect at 11:00 am—the "eleventh hour of the eleventh day of the eleventh month." Armistice Day is one of the most important military celebrations in France, since it was a major French victory and the French paid a heavy price in blood to achieve it. The First World War was considered in France as the "Great Patriotic War". Almost all French villages feature memorials dedicated to those fallen during the conflict. 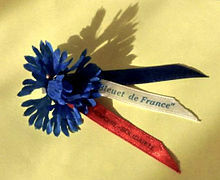 In France the blue cornflower (Bleuet de France) is used symbolically rather than the poppy. In 2009 the Danish government established Veterans' Day with early events on 5 September where past and present members of the armed forces, who have done service in armed conflict, are remembered. The German national day of mourning is the secular public holiday of Volkstrauertag, which since 1952 has been observed two Sundays before the first Sunday of Advent; in practice this is the Sunday closest to 16 November. The anniversary of the Armistice itself is not observed in Germany. Each of the major German churches has its own festivals for commemorating the dead, observed in November: All Souls Day in the case of the Roman Catholic Church, Ewigkeitssonntag or "Eternity Sunday" in the case of the Lutheran church. Though not a public holiday since July 1997, Remembrance Sunday is observed in Hong Kong, and is marked by a multi-faith memorial service at the Cenotaph in Central, Hong Kong. The service is organised by the Hong Kong ex-servicemen Association, and is attended by various Government officials and the representatives of various religious traditions such as the Anglican Church, the Roman Catholic Church, the Eastern Orthodox Church, the Buddhist community, the Taoist community, the Muslim community and the Sikh community. Although Hong Kong ceased to be part of the Commonwealth of Nations in 1997, the memorial service still resembles those in many other Commonwealth countries. The service includes the sounding of "Last Post", two minutes of silence, the sounding of "Reveille", the laying of wreaths, and prayers, and ends with a recitation of the "Ode of Remembrance". The Hong Kong Police Band continues to perform their ceremonial duty at the service. Members of the Hong Kong Air Cadet Corps (including the Ceremonial Squadron), Hong Kong Adventure Corps, Hong Kong Sea Cadet Corps and scouting organisations are also in attendance. In the Republic of Ireland, Armistice or Remembrance Day is not a public holiday. In July there is a National Day of Commemoration for Irish men and women who have died in war. Nevertheless, Remembrance Sunday is marked by a ceremony in St Patrick's Cathedral, Dublin, which the President of Ireland attends. During World War I, many Irishmen served in the British Army, but official commemoration of them (and other British soldiers) has been controversial. The British Army was used to suppress the Easter Rising (1916) and fought the forces of the Irish Republic during the Irish War of Independence (1919–22). A very small number of people living in the Republic still enlist in the British Army, although the British Army is banned from recruiting there under the Defence Act 1954. The Irish National War Memorial Gardens in Dublin is dedicated to the memory of the 49,400 Irish soldiers who were killed in action in World War I. In Israel there are two ceremonies, the first being in Jerusalem, at the British War Cemetery on the Saturday before Remembrance Sunday, organised by the British Consul in Jerusalem. The second ceremony is in Ramleh on the Sunday itself, organised by the British embassy in Tel Aviv. The Ramleh ceremony is the larger, and is also attended by veterans of the Second World War. In Italy, soldiers who died for the nation are remembered on 4 November, when the ceasefire that followed the Armistice of Villa Giusti in 1918 began. The Day is known as the Day of National Unity Day of the Armed Forces, Giorno dell'Unità Nazionale Giornata delle Forze Armate in Italian. Since 1977, this day has not been a public holiday; now, many services are held on the first Sunday in November. In the Netherlands, Remembrance Day is commemorated annually on 4 May. It is not a public holiday. Throughout the country, military personnel and civilians fallen in various conflicts since World War II are remembered. The main ceremonies are at the Waalsdorpervlakte near The Hague, the Grebbeberg near Wageningen and Dam Square in Amsterdam. Two minutes of silence are observed at 8:00 pm. Remembrance Day is followed by Liberation Day on 5 May. In Norway the Norwegian Armed Forces commemorate Veteran's Day. The Norwegian Parliament, the Storting, decreed that Veteran's Day would be observed on the same day as Victory in Europe Day, in Norway known as "Frigjøringsdagen", or Liberation Day. The ceremonies are held annually in Akershus Fortress, with the King of Norway, Harald V, present. The first of such ceremonies was held on 8 May 2011, with two Norwegian Special Forces Operators being awarded the War Cross for deployments in the recent War in Afghanistan. The ceremonies are observed with memorials and military salutes. 11 November is a public holiday in Poland called Independence Day, as the ending of First World War allowed Polish people to regain the freedom and unity of their country after over a hundred years of partitions. Major events include laying flowers on the Tomb of the Unknown Soldier by members of the government and highest authorities, other public ceremonies and church services and school celebrations. Veterans Day is observed in the United States on 11 November, and is both a federal holiday and a state holiday in all states. However, the function of the observance elsewhere is more closely matched by Memorial Day in May. In the United States, and some other allied nations, 11 November was formerly known as Armistice Day; in the United States it was given its new name in 1954 at the end of the Korean War to honour all veterans. Veterans Day is observed with memorial ceremonies, salutes at military cemeteries, and parades. ^ "The Remembrance Ceremony". rsa.org.nz. Archived from the original on 4 June 2010. Retrieved 11 November 2011. ^ "World War I Ended With the Treaty of Versailles". ^ "A Guide to Commemorative Services – Veterans Affairs Canada". Veterans Affairs Canada. 1 October 2011. Retrieved 11 November 2011. ^ "Read 2 Remember". Archived from the original on 13 November 2011. Retrieved 11 November 2011. ^ Staff writer (9 November 2009). "Remembrance Day Parade". CBC. Caribbean Broadcasting Corporation. 5297144. Archived from the original on 3 March 2016. Retrieved 10 November 2009. ^ Trujillo, Renee (11 November 2015). "Remembrance Day Observed in Belize". LoveFM. Archived from the original on 14 November 2015. Retrieved 12 November 2015. ^ "Bermuda Online honors Bermuda's war veterans". ^ Ministry of Labour and Advanced Education. "Remembrance Day Holiday in Nova Scotia". Queen's Printer for Nova Scotia. Retrieved 11 November 2011. ^ "Statutory holidays in Ontario". Statutory Holidays Canada. Retrieved 11 November 2011. ^ Office of Employment Standards. "Remembrance Day in Manitoba". Queen's Printer for Manitoba. Retrieved 11 November 2011. ^ "Public Holidays in Canada". Statutory Holidays Canada. Retrieved 11 November 2011. ^ Department of Canadian Heritage. "Thanksgiving and Remembrance Day". Queen's Printer for Canada. Retrieved 11 November 2011. ^ "Remembrance Day a statutory holiday? Attempt to make it so clears hurdle". CTV News. 6 November 2014. Retrieved 10 November 2014. ^ Veterans Affairs Canada (23 October 2014). "Remembrance – History – A Day of Remembrance – Introduction". Queen's Printer for Canada. Retrieved 13 October 2016. ^ Veterans Affairs Canada. "Canada Remembers > About Canada Remembers". Queen's Printer for Canada. Archived from the original on 19 January 2012. Retrieved 11 November 2011. ^ "Government of Canada Announces the Itinerary for the 2009 Visit of The Prince of Wales and The Duchess of Cornwall". 30 October 2009. Retrieved 11 November 2011. ^ The Canadian Press (11 November 2014). "Canada remembers: Governor General rededicates National War Memorial". Toronto Star. Retrieved 11 November 2014. ^ "National Remembrance Day Ceremony 2007". Royal Canadian Legion. Archived from the original on 25 May 2008. Retrieved 11 November 2011. ^ Berthiaume, Lee (8 November 2016). "Indigenous Canadians remember ancestors who fought, died in war". Globe & ail. ^ "R-03-2001: A Resolution to designate the 3rd of September each year as "Merchant Navy Day"". Company of Master Mariners of Canada. Archived from the original on 14 April 2009. Retrieved 7 August 2014. ^ "Remembrance day commemorated in Bangalore | Latest News & Updates at Daily News & Analysis". Dnaindia.com. 12 November 2012. Retrieved 18 May 2014. ^ Centenary Digital. "Delhi War Cemetery marks Remembrance Day 2013". Centenarynews.com. Retrieved 18 May 2014. ^ Nelson, Dean (10 November 2013). "Prince of Wales commemorates Remembrance Sunday in India". The Telegraph. Retrieved 5 September 2015. ^ "New Zealand Ministry for Culture and Heritage: Anzac Day". Mch.govt.nz. Retrieved 11 November 2011. ^ "NZ Returned Services Association: Poppy Day". Rsa.org.nz. Archived from the original on 19 October 2011. Retrieved 11 November 2011. ^ "Cenotaph war memorial restored in time for Remembrance Day". City of Cape Town. 28 October 2013. Archived from the original on 2 August 2014. Retrieved 2 August 2014. ^ "About the South African Legion". SA Legion. Retrieved 3 August 2014. ^ Hall, Robert (11 November 1999). "UK War dead remembered". BBC News. BBC. Retrieved 11 November 2011. ^ "War dead remembered". BBC. 11 November 1999. Retrieved 11 November 2011. ^ Anon. "The Royal Borough remembers — Remembrance Day and Armistice Day arrangements". The Royal Borough of Windsor and Maidenhead. Archived from the original on 7 February 2015. Retrieved 6 February 2015. ^ Barrow, Mandy. "Remembrance Day in Britain". Woodlands Junior School. Archived from the original on 10 November 2011. Retrieved 11 November 2011. ^ "Hundreds turn out for Remembrance Day parade in Rugby". The Rugby Advertiser. 12 November 2012. Retrieved 11 November 2017. ^ "Remembrance Sunday: Services honour war dead". BBC News. 13 November 2016. Retrieved 11 November 2017. ^ "Armistice Day, poppies and why the act of remembrance matters". The Daily Telegraph. 11 November 2017. Retrieved 11 November 2017. ^ Darrell. "The Remembrance Day 2014 Alderney £5 Brilliant Uncirculated Coin". The Royal Mint. ^ "Tower of London lights up in stunning Armistice memorial". Retrieved 13 November 2018. ^ Helen Robinson, 'Remembering War in the Midst of Conflict: First World War Commemorations in the Northern Irish Troubles', 20th Century British History, 21, 1 (2010). ^ "Anerkendelse er mere end en flagdag | Arbejderen" (in Danish). Arbejderen.dk. Retrieved 18 May 2014. ^ "Germany declines armistice day invite". BBC News. 4 November 1998. Retrieved 11 November 2011. ^ "Address by Mayor Hans Schaidinger for Volkstrauertag 2008". Website of the Regensburg Rathauser. 16 November 2008. Retrieved 11 November 2011. Unter den Linden Memorial, Regensburg city park, 11.45], "Seit genau 56 Jahren begehen die Menschen in Deutschland nun schon, immer am vorletzten Sonntag des Kirchenjahres – zwei Sonntage vor dem 1. Advent – den Volkstrauertag." ^ Alan Cowell and Steven Erlanger (11 November 2009). "France and Germany Use the Remembrance of a War to Promote Reconciliation". New York Times. Retrieved 11 November 2011. ^ "Heritage Appraisal of the Cenotaph" (PDF). Antiquities Advisory Board. Retrieved 20 November 2018. ^ "Club Chairman participates in Remembrance Day ceremony". The Hong Kong Jockey Club. 2012-11-12. Retrieved 20 November 2018. ^ "Harper honours Canadian war dead in Hong Kong on Remembrance Day". The Globe and Mail. Retrieved 20 November 2018. ^ "Northern Ireland honours war dead". BBC News. 11 November 2001. Retrieved 10 April 2010. ^ 9 November 2003 – 11:09:32 (18 February 2008). "President to attend Remembrance Day ceremony in Dublin". BreakingNews.ie. Retrieved 23 February 2011. ^ "North and South of Ireland fighting the Taliban together". Belfasttelegraph.co.uk. ^ Bootcamp Ireland (6 September 2008). "Irish soldier killed in bomb blast told of Afghan fears – National News, Frontpage". Independent.ie. Retrieved 23 February 2011. ^ Self-catering (18 October 2008). "The Irish recruits who fight for Queen and country – Jobs & Careers, Lifestyle". Independent.ie. Retrieved 23 February 2011. ^ "Department of Taoiseach". Taoiseach.gov.ie. Retrieved 23 February 2011. ^ "4 novembre 2010 – Giorno dell'Unità Nazionale Giornata delle Forze Armate". Retrieved 11 November 2011. ^ "From the Italian government website" (PDF). Governo.it. Archived from the original (PDF) on 25 March 2009. Retrieved 23 February 2011. Wikimedia Commons has media related to Remembrance Day. Remembrance Day For All – Towards discussion that includes everyone in our Remembrance of Canada’s wars. Jonathan F. Vance: Commemoration and Cult of the Fallen (Canada), in: 1914-1918-online. International Encyclopedia of the First World War.